I have swapped over entirely to R/O (reverse osmosis) water, which requires me to add back in certain ions to achieve good tasting water and beer. The largest requirement is calcium, through the careful additions of calcium chloride (CaCl2) or powdered gypsum (CaSO4) to acidify the liquor and mash. Other minerals can be used, such as baking soda, chalk or pickling lime to add alkalinity. Distilled, D/I and R/O water changes rapidly and with very subtle additions, and I have become fairly careful about planning out my water treatments, and double checking my measurements. I use Martin Brungard’s Bru`n Water Spreadsheet to help model and predict. Martin has been extremely helpful in getting my thinking more or less wrapped around water chemistry. My procedure is to measure pH at room temperature. My samples are gathered, then put into an ice bath if cooling is needed. Then they warm to room temperature before measurement. I calibrate my pH meter as needed, generally before brewing and once again midway. I also use these samples (from the mash) to check for conversion with iodine, unless it is obvious conversion has happened (using senses). I tend to heat my strike water separately from my sparge water. Really this is just a convenience, but also allows me to fully dissolve the additions before adding in the grist. I don’t believe there is a specific advantage over simply adding to the mash at dough in. However, I am confident that I know the pH of the strike water, and can compare or observe the shift in pH as the mash temperature stabilizes. This gives me the earliest opportunity to shift the pH up or down as required. I tend to target a strike water pH of 6.0 as the mash will bring that down quickly. As the mash is working, I also am heating and preparing my sparge water. Generally this is simply to push pH into the correct range, and not dramatically influence the mash pH running off into the kettle. I tend to target sparge water pH of 6. This allows a slight rise in pH particularly at the last runnings into the kettle, without danger of high pH causing tannin extractions. This adjustment is made with 10% phosphoric as it has little to no flavor contribution. Martin has since recommended that I treat the sparge water with the ion additions, rather than using phosphoric. I plan to do this with my next brew. As I mentioned, my strike water is already treated, so I monitor my mash pH to ensure that I land between 5.2 and 5.6 pH – depending on the recipe. Beer styles (and grist make up) will dictate where this falls, but it is a surprisingly narrow range. I should use a tiny amount of pickling lime or soda to bring pH up – but judiciously as I don’t “like” those flavors in my beers and am careful not to exceed the flavor thresholds. Or I will use 10% phosphoric acid to reduce pH to the right level. It is important to add a little at the time, to prevent over or undershooting the target, and I generally wait 5-7 minutes to allow the move to occur while I am recirculating. Honestly I have been ignoring this from a pH perspective, as well as into fermentation. I do add any excess flavor mineral salts to the kettle, and since they are largely acids, I should check towards the end of the boil. Based on Martin’s recommendations, as well as Chris Colby’s articles, I will only add calcium additions here if required. pH in the kettle (a function of the presence of calcium and phosphates) are critical to creating good break material as well as significant flavor contribution. 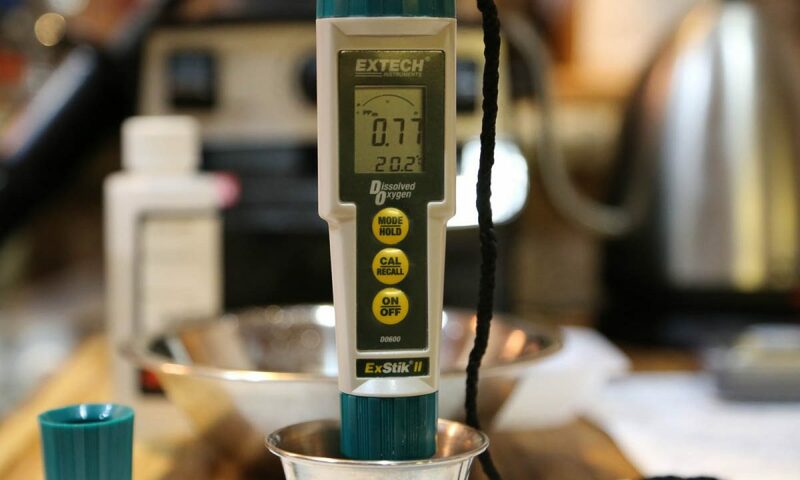 I have read from Chris Colby and Kai Troester that boil kettle pH is critical in preparing the wort for fermentation everything from hop utilization to clarity to the final flavor. In some styles a very low pH (below 4.2) is required in the finished product, others a more neutral 4.4-4.8 is desired. Yeast, during fermentation will naturally lower the pH and regulate it to their benefit. Most people will read this as an over complication of preparing my water and I cannot argue that it is not. However, I have had much better success and repeat ability doing so. Many people add all of the salts into the liquor and let it ride, adjusting pH with acid or base until it achieves the optimal level. This is a choice based on personal preference and gear and convenience. Salts, particularly when using distilled or R/O water, to me are flavoring additions first. I then use a portion of those additions to achieve the desired pH in the mash, then add the remaining salts into the kettle. This maybe a mistake as I am ignoring kettle pH and maybe bringing it too low, which means I should also consider lime/soda additions to add alkalinity. I also get nervous when I see relatively large additions – particularly for an IPA with a lot of sulfates… this will pass as I use them with success. Time to brew a dark beer it seems… porter or stout?